Wednesday's congestion follows two days of easy driving, as snow and ice kept most motorists off the roads. 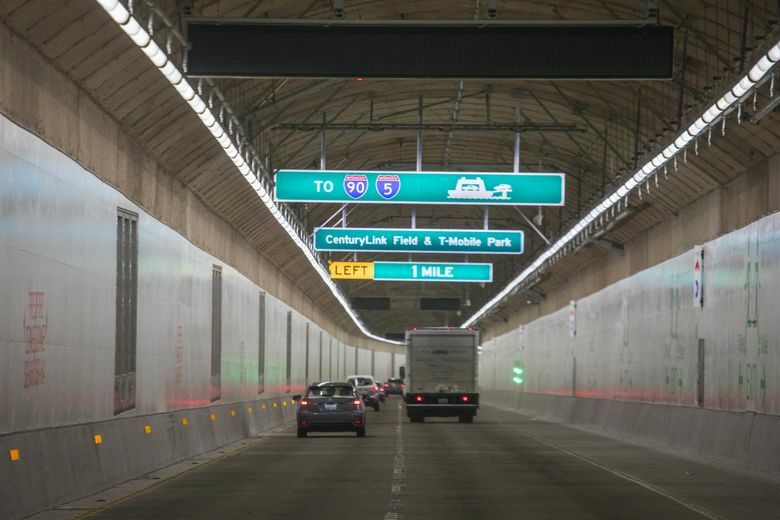 Cars and trucks filled the new Highway 99 tunnel again Thursday morning, a day after 3-mile backups surprised many drivers Wednesday. A total 64,302 vehicles traveled the tunnel on Wednesday, including more northbound than southbound trips, the state traffic-control center reported. At 7:40 a.m. Thursday, traffic slowed to 25 mph midtunnel going northbound. From there cars cruised steadily to the Mercer Street exit. A trip from Nucor Steel in West Seattle to mid-South Lake Union took 18 minutes, or less than half a 2018 typical drive. But by 8:30 a.m. congestion increased, to stop and go near the stadiums. Congestion showed up later and less severely than a typical Alaskan Way Viaduct commute this decade. But then, a stalled vehicle blocked one lane for about 10 minutes, causing worse slowdowns back through Sodo. Some drivers remain confused by the First Avenue South/Downtown exit near the stadiums — which doesn’t open until sometime next week — causing some abrupt braking and lane changes. The deck is finished for that northbound ramp, but contractors are working on the side barriers. The main chokepoint has been the Mercer Street/Interstate 5 exit, where a one-lane ramp leads to two lanes at a stoplight. Even with green-light time added, the offramp’s intersection across Dexter Avenue North caused a car lineup to extend into the tunnel. Local transportation officials last month worried about slowdowns there, while added traffic poses safety and congestion challenges in the growing neighborhood. Wednesday was the first full-volume commute since the tunnel opened after midnight Monday, followed by snow and ice that kept most motorists off the roads for two days. “It’s going to take a while for a new normal to happen,” said Bart Treece, spokesman at the Washington State Department of Transportation traffic-control center in Shoreline. Drivers are trying lanes for the first time, he said. Drivers continuing north toward the Aurora Bridge were immediately able to regain 40 mph speeds in the Aurora Avenue North mainline, after leaving the tunnel. The four-lane tunnel’s grand opening this week rekindled old arguments from a decade ago across the spectrum, about whether the $3.3 billion project represents a missed chance to slash car traffic and carbon pollution; about whether a temporary traffic dip during last month’s three-week Highway 99 closure proved the lanes aren’t needed; or from the other side that returning traffic shows WSDOT should have built a bigger highway with downtown exits. The Alaskan Way Viaduct in its heyday carried 105,000 to 110,000 cars at its busiest point, which declined to 90,000 as the tunnel construction itself reduced passage to two lanes each way near Pioneer Square, while public transit service improved. Traffic counts for Wednesday aren’t available until Thursday afternoon. State projections say 97,000 drivers will use the tunnel toll free. The viaduct is to be demolished beginning next week. 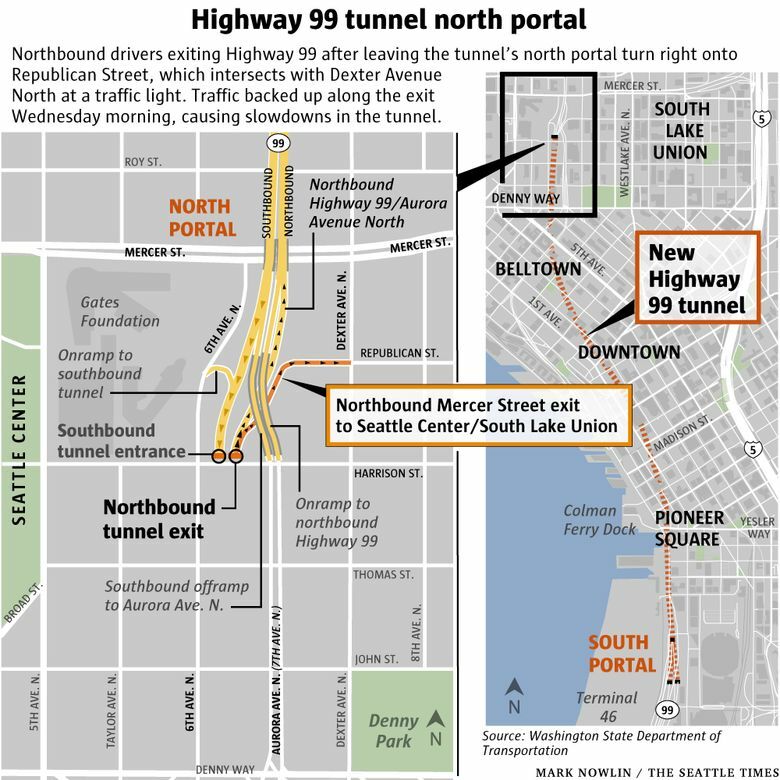 The four-lane tunnel, with its interchanges on the downtown fringes, rearranges the Highway 99 congestion points. The Mercer exit, in particular, performs quadruple duty — helping drivers go crosstown to I-5; delivering commuters to booming South Lake Union; serving part of the Interbay, Uptown and Seattle Center drivers that formerly exited at Western Avenue off the old Alaskan Way Viaduct; and handling new trips that backtrack from the Mercer exit south toward downtown. KIRO Radio reported Wednesday seeing smog buildup at the north end because automatic fans didn’t turn on as intended. WSDOT later turned them on manually. Private transit traveled through the tunnel Wednesday. Amazon told The Seattle Times that as of last week it was considering options for its private buses. King County Metro will consider future tunnel routes once demand settles down, but not until the 2021 budget cycle at the soonest, service-development director Bill Bryant said last week. Still, that didn’t stop one Metro driver from mistakenly taking a Route 120 coach through the tunnel about 8 a.m. Wednesday. The bus from White Center and Delridge went through the tunnel instead of using Fourth Avenue South and the Sodo busway toward downtown, a rider tweeted to Metro, prompting the agency to apologize. Other buses in the area on Wednesday moved easily in the busway, including the C Line trip taking 25 minutes from Alaska Junction to Seneca Street.